Launched in April 2015, by ex-innocent colleagues, and friends, Paul Lederer and Charlie Hoare, TAPPED Organic Birch Water has just launched in Asia with plans to expand global presence and have not yet done any interviews to discuss this. The award winning company sells water sourced directly from the trees of Finland during the tapping season in April, which is a Nordic tradition. Birch water is the sap that flows within birch trees. 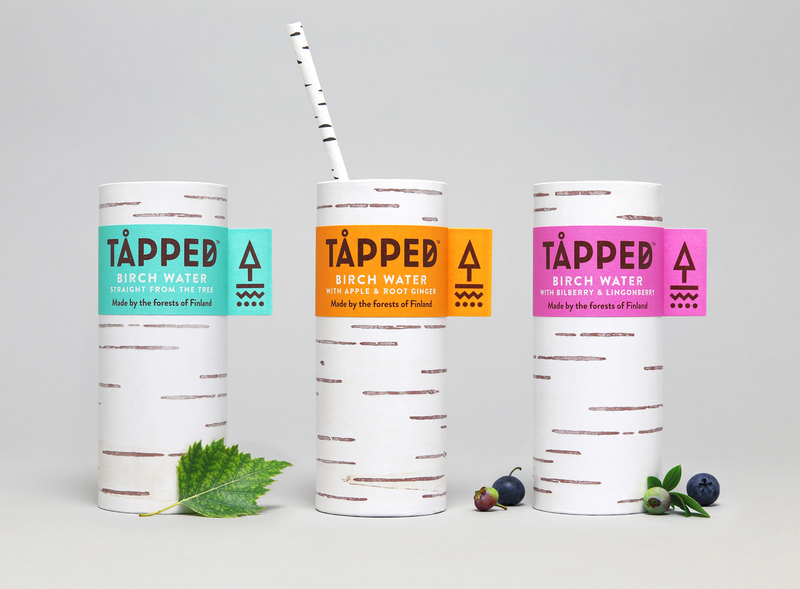 It looks and feels like water and contains vitamins, minerals, amino acids, nutrients, as well as 1% naturally occurring fruit sugars, so it gives birch trees everything they need to grow. Birch trees can be tapped once a year, at the end of winter and start of spring, when temperature rises cause the sap to flow up inside the tree (birch tree work like maple trees and in both cases the sap can be tapped and consumed straight, or boiled to reduce the water content and make birch syrup and maple syrup). We didn’t! Tapping birch trees has been practiced in the Nordic, Baltics and other parts of the world for centuries, with sap enjoyed every spring as a rejuvenating and revitalizing tonic thanks to all those vitamins, minerals, amino acids and nutrients contained within. All we’re doing is making this traditional more widely known and the end product, birch water, more widely available for everyone to enjoy! How is birch water more nutritious than regular water? We tend not to compare birch water to tap water as we wouldn’t want people to be dissuaded from drinking tap water. We do understand however that people find regular water, whether bottled or from the tap, a little boring, so the light delicate flavour of birch water provides something different. Birch water is also great as an alternate to sugar and artificially sweetened soft drinks: our Pure Organic Birch Water has only 8 calories per 250ml carton, while our flavoured versions which blend birch water with up to 25% fruit juice have only 31- 38 calories per carton. All in all this makes birch water a great natural, tasty, good for you healthy alternative to other less virtuous soft drinks. Sustainability has always been at the heart of what we do, which is probably not a surprise given that our drinks comes from trees. Tapping birch trees for sap is a great alternative use for the trees vs say chopping them down for logging industry use. TAPPED comes in recyclable paperboard cartons which have a lower carbon footprint vs other packaging forms like cans & bottles, and obviously they help reduce plastic use too. How can birch water help people live healthier lives? We can clearly help people who want to reduce their sugar intake as we have a range of soft drinks which are incredibly low in calories yet taste great as we haven’t compromised on flavour. We’ve just launched 1L version of our Pure 100% Organic Birch Water: “Do you make a larger pack?” is always the no 1 question we get asked at consumer shows, events, instore samplings as people want a better value fridge pack so they can enjoy their daily glass of birch water, but also so they can use birch water as a base for smoothies, as birch water helps reduce over sugar content vs other base ingredients like juice or coconut water (birch water is ¼ of the calories of coconut water). Combined with the rejuvenating and revitalizing benefits of birch water thanks to the blend of vitamins, minerals, amino acids, nutrients, birch water can help people live healthier lives. What are the 5 things you wish you knew before starting a drink and wellness brand? 1. Just how much work is required to educate consumers about what birch water is and why to drink it — it’s always enjoyable seeing how pleasantly surprised people are when they try birch water for the first time, and finding the most efficient way to achieve this goal something we’re constantly working on! 3. How social media really works. It takes a lot of time to really work what truly adds value and I feel that we’ve spent a lot of time & energy doing things without really knowing how effective they’ve been. Understanding more earlier could have meant we could have done less but better. 4. Just how time consuming fundraising would be — we undertook a crowdfund last year and raised over £220k but it absorbs so much time & energy and is distracting, and we think the business suffered a little. Thankfully we’ve been able to accelerate in 2018 such that by end June we had matched 2017’s full yearsales. What advice do you have for other CEOs? Be clear about what you’re trying to achieve, be focused and be relentless in your pursuit of these goals. Be open to adapt but if you do be certain that it’s the right thing to do. Build good teams. Recruit amazing talent. Enjoy the journey with them. What is next for birch water? We’re going to continue to develop the UK market, building on the huge strides we’ve made this year which has resulted in more and more people regularly drinking birch water. That will mean more flavours, pack size and formats, supported by marketing activity to drive awareness and trial. At the same time given our international success we’re also exploring some overseas opportunities. Our Singapore success, working with an excellent local partner, suggests that there could be very good opportunities for birch water in Asia, so we’ll visiting a few markets later in the year, and we’re also looking at more European opportunities.